Mayor Coderre is more than a bit of a showman, but sometimes he gets things right. Opposition Projet Montréal hates the things too. I haven't any idea where on earth they could put the damned things around here. There used to be a few vacant lots but they are all condo buildings now. Do they really want more consultation, though? I mean, in good faith? They just want more input into where the boxes will be located? Because I kind of get the sense that they just don't want them at all. Full stop. I will commend Coderre with trying to get more social housing created. I also think that it is positive that he take a stand on home delivery. As much as it seems like a lightweight issue,I'm yet to meet anyone who agrees with community boxes. So many issues to deal with and our current governemnt is on the wrong side of most if not all of them. Hey, look at me, Denis Coderre!!! My old Liberal seat may be going NDP, so I'd better show the public that I'm doing something right! If you're talking to people who currently enjoy home delivery that shouldn't be surprising. Who's going to prefer them to having someone bring your mail right to your door? But I doubt you'd get the same hand-wringing if you spoke to people who currently have central delivery and have always had central delivery. It's no more of a big whoop for them then is having to go to the store for milk since they phased out milkmen. AFAIK there are no community boxes on the Island of Montreal. I can't speak for Toronto or Saskatoon. I get my mail at a proper Canada Post Office. The new part of our Village has those ugly boxes. I would never buy a house in the same block as one of those outdoor eyesores. I hate litter and wouldn't want to work for free to pick up the junkmail blowing onto my property. Go ahead have consultations and if they can find a block full of home owners willing to have them then its good to go, otherwise build substations with not only mailboxs but a postal outlet and CUPW staff. I hate litter and wouldn't want to work for free to pick up the junkmail blowing onto my property. The litter problem is a fascinating one. Nobody wants litter blowing everywhere. So then who's just tossing their admail on the ground?? Tell me it's not The One Bad Apple! I hate that guy!! That said, I'm always amused to see how many residential homes in my area have handwritten signs on their mailboxes that say "NO JUNK MAIL!!" or "NO FLYERS!!!" or whatever. Currently, admail is one of the few Canada Post services that's not in sharp decline. It's one of the ways by which they can still generate revenues. But OMFG, it means I have to put a pizza flyer in my blue box, so I'll have none of it! Why can't Canada Post remain viable and sustainable just by delivering birthday cards? So what will be Canada Post's response to their political masters ideological mandate to start dismantling the actually profitable postal service? Canada Post operates at arm's length from the government of the day. So who are its "political masters"? Perhaps this will free up more money so that the Harper can pursue his small minded little war against Syria at the behest of Israeli zionists. Canada Post also receives no transfer payments from the government of the day. So how will phasing out home delivery put more money into Harper's Zionism Slush Fund? Actually, there's an active thread right now in which some newbie is proposing that babblers have a disproportionate and illogical obsession with Israel. Why not post this silliness there and prove him right? I het my mail at the local post office in the vilalge centre when I buy milk and bread at the local grocery store. Would hate to see it replaced by a community box that was nowhere near anywhere else I ever go. 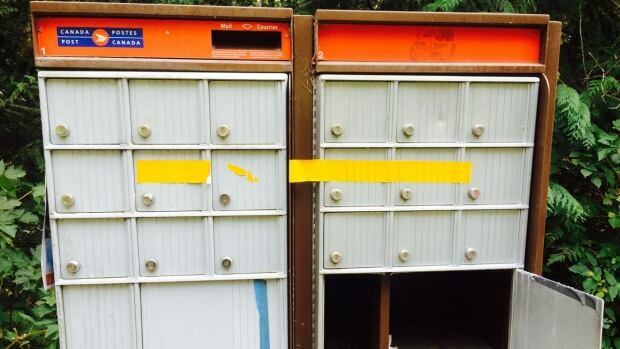 Another good example of Canada Post's thinking about property owners. I'd have no problem fetching my mail at my local post office. Problem is, they shut it. This is inside a NATURE PARK. "It was cool seeing Mayor Coderre destroy the Canada Post concrete slab. But I can't help thinking that if someone associated with the left - like, say, Amir Khadir - had done exactly the same thing, they would have called him a vandal and a terrorist..."
..the community box issue has always been about the government wanting to sell off a public asset. the taking away of home delivery this time round is to piss off the public..making it easier to sell it off. it's not about nor has it ever been about saving money or mail volume. And if he had been audaciuos enough to be wearing a V mask the RCMP would likely shoot him dead in the streets. WE ARE ALL James McIntyre. "Well it's time to lift the corporate veil and say, 'No, Canada Post is owned by us, the citizens, and the government represents us. And if we as citizens decide it's time to call a moratorium on this misguided policy, then Canada Post should listen.'" So says the Mayor of Westmount. Montreal Mayor Denis Coderre took a sledgehammer to his Blackberry smartphone today in front of astonished press and onlookers, as part of a recent initiative to convince Canada Post to continue home mail delivery for the minority of homes that currently enjoy it. Our house is about 20 years old and we've never had home delivery. There's always been a communal mailbox. "As much as it seems like a lightweight issue,I'm yet to meet anyone who agrees with community boxes.'" Well, you've met one now. This issue drives me batshit crazy, but I'll try to remain calm. I haven't had door to door service since 1989. I've lived in three different communities with those big mailboxes, and not once has anyone thrown flyers on the ground. Neighbours just don't do that sort of thing. 95% of my mail is junk. I'd be content to get it once a week. I don't mind walking 50 yards to get my junk mail once in a while. I don't want to see people lose their jobs, but it seems to me a phase-out of the remaining door to door service, as people retire, wouldn't be inhumane. People say "what will granny do in the winter?" Answer: the same as the 2/3 of grannies who haven't had the service in a quarter century. Trudeau promised to study the issue, which is simply cowardly. Mulcair promises to restore service. To whom? To the people who've lost it in the past couple of years? To the millions of us who haven't had it in 25 years? I don't think he's made this clear. I haven't had door to door service since 1989. I've lived in three different communities with those big mailboxes, and not once has anyone thrown flyers on the ground. Neighbours just don't do that sort of thing. I drive past community boxes every time I visit people off the island, and in some parts of the island as well. The first thing I notice, almost always, is the litter. Obviously, we Quebecers need to learn the value of good neighbourliness and cleanliness. I do envy you! I've never seen any litter on the communtiy boxes around here (in Quebec) -- I suspect it's urban vs rural. Urban community boxes have to be monster-sized, and that will encourage littering. Few would dare when the neighbour they see all the time might see them littering! No littering in my local post office either, but the recycling box by the door fills up fast. Ideal solution: get rid of junk mail! "Ideal solution: get rid of junk mail! " Then Canada Post would lose its reason to exist altogether, wouldn't it? It would be kind of depressing if junk mail was Canada Post's "reason to exist", but admail -- as they call it -- is evidently a pretty large chunk of their revenues (something like 30% or more, IIRC). Any word on Denis Coderre's whereabouts at the time? The Sûreté du Québec confirmed on Wednesday that it has taken over an investigation into Mayor Denis Coderre at the request of the Montreal police department. The SQ is looking into an incident where Coderre used a jackhammer to destroy the base of a future community mailbox in Pierrefonds last month. Provincial police would not say what charges Coderre could be facing or even if investigators have met with him. What a terrible waste of time and resources. If you mean that some politicians could have been doing something useful, and so could that jackhammer, I agree. And now someone has to haul away the rubble of a perfectly functional concrete pad, and pour another one. A waste indeed. If you mean that now the Sûreté is going to have to pay for DNA testing on the sweat from that jackhammer, and mount a massive manhunt to find the culprit, I don't think so. Is there some reason why being mayor should entitle you to destroy something you don't like?